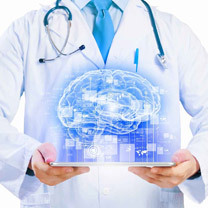 «Gamma Knife»® is a high-technological and computerized device that uses state-of-the-art advances in medical radiology, neurosurgery and robotics. Radiosurgery is used for treatment at the stage when the tumour measures less than 3–3.5 cm and has no clear manifestations. It is of special importance in case of deep-seated abnormalities in the most vulnerable areas of brain. Besides, radiosurgery is indicated for secondary tumours or tumours which were not totally removed by previously performed treatment. Radiosurgery is suitable for treating tumours which are resistant to radiation. Due to its reliability, accuracy and efficacy, «Gamma knife»® is considered the gold standard in radiosurgery. 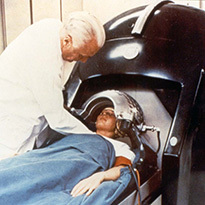 The first «Gamma knife»® surgery was performed in 1968, and about one million patients have undergone treatment since then. has been proved by long-lasting observations (for over 50 years) and recorded in 2,000 publications. The patient can leave the clinic and resume normal activities straight after the procedure. Our consultants will answer all your questions, and experienced doctors will define whether «Gamma knife»® treatment is necessary. Our manages glad to answer all the questions. Experienced oncologists will determine whether gamma-knife can be used in your case.